Aspergillus fumigatus is a ubiquitous saprotrophic fungus and an opportunistic pathogen of humans and animals. Humans and animals can inhale hundreds of A. fumigatus spores daily. Normally this is harmless for humans, but in case of immunodeficiency, invasive pulmonary aspergillosis (IPA) can develop with a high mortality rate. A. fumigatus also causes non-invasive mycoses like sino-nasal aspergillosis (SNA) in dogs. In this study we compared A. fumigatus isolates from humans with suspected IPA, dogs with SNA, and a set of environmental isolates. Phylogenetic inference based on calmodulin (CaM) and beta-tubulin (benA) sequences did not reveal A. fumigatus sub-groups linked to the origin of the isolates. Genotyping and microsatellite analysis showed that each dog was infected by one A. fumigatus genotype, whereas human patients had mixed infections. Azole resistance was determined by antifungal susceptibility testing and sequencing of the cyp51A gene. A total of 12 out of 29 human isolates and 1 out of 27 environmental isolates were azole resistant. Of the azole resistant strains, 11 human isolates showed TR34/L98H (n = 6) or TR46/Y121F/T289A (n = 5). Phenotypically, isolates from dogs were more variable in growth speed and morphology when compared to those isolated from human and the environment. A. fumigatus from dogs with SNA are phenotypically very diverse in contrast to their environmental and human counterparts. Phenotypic variability can be induced during the chronic infection process in the sinus of the dogs. The basis of this heterogeneity might be due to genomic differences and/or epigenetic variations. Differences in dogs is a could be a result of within-host adaption and might be triggered by environmental factors in the sinus, however this hypothesis still needs to be tested. Aspergillus fumigatus is a filamentous saprotrophic ascomycete that occurs world-wide . This fungus produces large numbers of conidia that are released into the air [2–5]. Estimates indicate that humans can inhale a few hundred of these asexual spores of A. fumigatus a day [2, 6]. Their small diameter of 2–3 μm and hydrophobic surface enables them to reach the alveoli . Yet, most of them are trapped and removed by the mucociliary escalator or by immune cells present in the lung tissue. Upon germination, they can cause invasive or non-invasive forms of aspergillosis. The former is characterised by the penetration and infection of tissues . A. fumigatus has been shown to secrete mycotoxins like gliotoxin, verruculogen, fumagillin and helvolic acid, which can affect ciliary beat frequency and promote colonization of lung epithelium [9, 10]. Invasive aspergillosis most often occurs in individuals with impaired cell-mediated immunity . Additionally this fungus is able to cause mycosis in animals such as cats and dogs . For instance, it is responsible for most cases of sino-nasal aspergillosis in dogs (SNA) . Canine SNA is clinicopathologically similar to chronic erosive non-invasive fungal sinusitis in humans . It is characterized by the formation of fungal plaques (i.e. fungal biofilms) in the nasal cavity and frontal sinus. Other than in some invasive forms of aspergillosis in humans , no evidence of impaired innate or adaptive immune responses have been described for dogs suffering from SNA [15, 16]. Notably, mesocephalic and dolichocephalic dogs seem to be affected with a higher frequency as compared to brachycephalic dogs for reasons that remain elusive but which could be related to a smaller sino-nasal surface area of the latter . In cats A. fumigatus is one of the causative agents of upper respiratory aspergillosis (URTA). URTA in cats can be divided into sino-nasal aspergillosis (SNA) and sino-orbital aspergillosis (SOA) of which SOA is the most common condition. SNA in cats resembles SNA in dogs and is caused primarily by A. fumigatus but also by Aspergillus niger. SOA, on the other hand, is most commonly caused by Aspergillus felis sensu lato . Still, these infections in humans, dogs and cats are, like most fungal infection in mammals, relatively uncommon, especially considering the ubiquity of A. fumigatus conidia in the environment. Fungal infections are treated with a range of antimycotic compounds. The antifungal activity of azoles is based on the binding to ergosterol synthase. Both cyp51A and cyp51B of A. fumigatus encode for this lanosterol 14α-demethylase. Azole resistance induced mutations have been described mainly in cyp51A [18–20]. These mutations can involve tandem repeats in the promotor area in combination with point mutations in the cyp51A gene. Of these, the TR34/L98H [21, 22] and TR46/Y121F/T289A [23, 24] are most frequently reported with an incidence of up to 20% % in the Netherlands depending on the site of isolation of the resistant strain . Additionally it has been suggested that about 10% of azole resistant strains that does not possess a mutation of the cyp51A gene can be explained by increased activity in ABC transporters that helps to detoxificate the fungal cell from azoles, or mutation in other genes like hapE [20, 26, 27]. Here we performed a comparative phenotypic and genetic analysis of A. fumigatus isolates from dogs with SNA, human patients suspected of having invasive A. fumigatus infection from a well-defined group of high-risk patients from the haematology ward and the intensive care unit (ICU), and isolates from indoor and outdoor substrates. 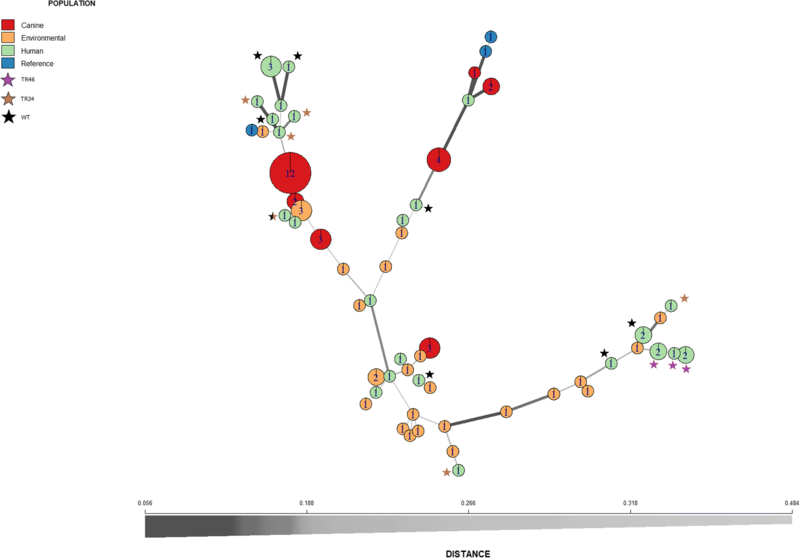 Phylogenetic inference based on calmodulin (CaM) and beta-tubulin (benA) sequences did not reveal A. fumigatus sub-groups but dog isolates were more variable in growth speed and morphology. Possibly, A. fumigatus evolves within the dog during the infection process by mutations and / or epigenetic variations. A total of 87 isolates of A. fumigatus were used (Table 1; Additional file 1: Table S1) that were derived from the environment (n = 27), infected dogs (n = 27), and humans (n = 29). A. fumigatus var. ellipticus type-strain , A. fumigatus Af293, and A. fumigatus Af1163 were included as reference strains. 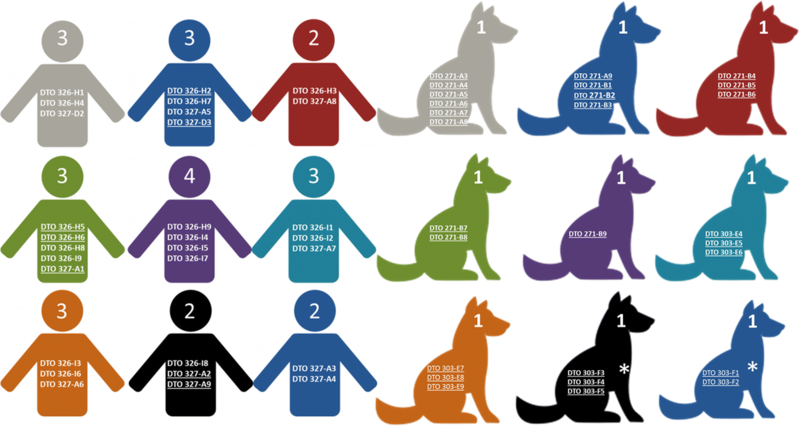 A. fumigatus isolates were originated from 9 dogs (Canine patient CP1–8.2, Additional file 1: Table S1) suffering from SNA presented at the Faculty of Veterinary Medicine in Utrecht between 2010 and 2012. One dog (CP8) was presented twice at the hospital due to a reinfection after 2 years (CP8.2 with isolates DTO 303-F1 and -F2, Additional file 1: Table S1). Hospitalized canine patients suspected to suffer from SNA were subjected to computer tomography (CT), and endoscopic/rhinoscopic, and haematological analysis. Clinical signs specific of SNA are unilateral or bilateral mucopurulent nasal discharge, depigmentation of the nasal planum, an increased airflow through the nostrils, and an enlarged ipsilateral mandibular lymph node. In the case a fungal plaque was detected (Additional file 1: Table S1), tissue and blood samples were sent to the Veterinary Pathology Diagnostic Center and the Veterinary Diagnostic Laboratory of Utrecht University. Haematocrit, leucocytes, blood cell differentiation, total protein, albumin and the protein spectrum was measured in the blood samples. Fungal plaques were obtained via trephination of the frontal sinus and/or rhinoscopic removal in the nasal sinus with a 30 degrees 2.7 mm rigid endoscope and using a combination of suction and a metal hook. Trephination was performed if mycotic plaques in the frontal sinus were diagnosed by CT. After removal of the fungal plaques the nasal sinus was flushed in most cases with clotrimazol for 15 min each in ventral, left and right lateral, and dorsal recumbency, followed by flushing for 15 min in ventral recumbency, after which the clotrimazol was allowed to leave the nasal sinus by gravity (head down). Part of the fungal plaque was immediately frozen in liquid nitrogen and stored at − 80 °C. Remaining material was placed on ice and used for microbial culturing and histological analysis. Culturing was started at the same day on potato dextrose agar (PDA, Becton Dickinson, Le-Pont-De-Claix, France) and care was taken to inoculate plates with different pieces of fungal plaques of the same dog. Colonies incubated for 2 days at 37 °C presenting macroscopical characteristics of A. fumigatus were sub-cultured on PDA plates using vegetative mycelium from the outer part of the colony as an inoculum. Conidial suspensions were made as described . Isolates from A. fumigatus were obtained from 9 high-risk patients from the intensive care and haematology units of the Utrecht University Medical Center (UMCU) who were suspected to have developed invasive aspergillosis (patients HP1–9; Additional file 1: Table S1) but none of them had received prophylactic antifungal therapy. These isolates were obtained between 2011 and 2013 from sputum, bronchoalveolar lavage, or pleural fluid (Additional file 1: Table S1; ). The human isolates were provided as colonies on Malt Extract agar (MEA) plates. In order to eliminate the possibility of having more than one isolate per plate, colonies were sub-cultured on PDA plates using vegetative mycelium from the edge and the centre of the colonies as inoculum. Plates were inoculated by tracing a double zigzag pattern with a plastic inoculating loop. After incubation at 37 °C for 3 days, plates were inspected for the presence of colonies with different morphology. Clearly distinct colonies were treated as different isolates. Conidial suspensions were prepared as described . Phenotypic characterization was performed on creatine sucrose agar (CREA), Czapek yeast agar (CYA), CYA with 5% NaCl (CYAS), dichloran 18% glycerol agar (DG18), malt extract agar (MEA), yeast extract sucrose agar (YES) as recommended . A 3-point inoculation was used and plates were incubated lid-side up at 25 °C for a period of 7 days in the dark. Diameter of colonies was analysed by ImageJ  after taken photographs from a fixed height with a Canon camera with a telephoto lens. They were subjected to PCA and k-means clustering with k = 3 corresponding to the initial number of groups (i.e. indoor and outdoor substrates, dog, and human). In addition, colour of the medium underneath the colony, spatial distribution of conidia formation, and morphology of the conidiophores was analysed. Pictures of conidiophores and conidia were made as described . Mycelium was scraped of colonies that had been grown on MEA for 7 days. This mycelium was mounted on an object glass in a drop of lactic acid and a very small drop of ethanol (70%) was used to flush the excess conidia outward. Samples were studied using Olympus BH2 and Zeiss Axioskop microscopes. Genomic DNA was isolated with the UltraClean Microbial DNA Isolation kit (MO BIO Laboratories, Solana Beach CA) and used to PCR amplify fragments of calmodulin (CaM), β-tubulin (benA), and the mating type loci MAT1–1 and MAT1–2 (Table 2; ). Sequencing of the reverse and forward strands was performed using the Big Dye® Terminator Cycle Sequencing Ready Reaction kit (Applied Biosystems, Foster City, CA, USA). Products of the sequencing reactions were purified using Sephadex G-50 gel filtration (GE Healthcare, Little Chalfont, Buckinghamshire, UK), equilibrated in double-distilled water, and analyzed using the ABI PRISM 310 Genetic Analyzer (Applied Biosystems). The CaM and benA sequences of the isolates and A. niger NRRL326, A. clavatus NRRL1, A. felis CBS130245, A. lentulus NRRL35552, A. fumigatus NRRL5109, A. fumigatus NRRL164, A. fumigatus NRRL163, and N. fischeri NRRL181 were used to construct a phylogenetic inference. Phylogenetic trees were constructed using the ETE Toolkit pipeline  and visualized with Figtree v1.4.2 (http://tree.bio.ed.ac.uk/software/figtree/). Microsatellite genotyping was performed using the STRAf assay as described . All nine markers data were imported into R package poppr  to construct a minimum spanning tree. Bruvo distance was used to determine genetic diversity between isolates . TR34 and TR46 repeat analysis within cyp51A was performed using qPCR as described , additional information about the sequence of the cyp51A was available for human isolates (Additional file 1: Table S1). Microdilution assays to determine Minimum inhibitory concentrations (MIC) of itraconazole (Santa Cruz Biotech, Dallas, USA), posaconazole (MSD, Kenilworth, USA) and voriconazole (Pfizer, New York, USA) were performed according to EUCAST (http://www.eucast.org/fileadmin/src/media/PDFs/EUCAST_files/AFST/Files/EUCAST_E_Def_9_3_Mould_testing_definitive.pdf). CT scan and rhinoscopy confirmed sinonasal mycosis in 9 dogs presented at the Veterinary hospital at Utrecht University. Histopathological biopsies showed non-invading hyphae on the mucosal surface. The lamina propria was not invaded (Additional file 2: Figure S1). Conidiophores were rarily observed, which is consistent with the observation that fungal plaques in the nasal cavities were white (Additional file 2: Figure S1B). The lamina propria was infiltrated by large amounts of lymphocytes, plasma cells, and neutrophil granulocytes. Haematological analysis showed differences in the levels of blood albumin in all dogs. Four dogs showed signs of mild blood loss in the weeks before the treatment, which could explain the hypoalbuminemia. Together, all 9 dogs suffered from a chronic lymphoplasmacellular rhinitis with fungal hyphae and ulcerations. A phylogenetic tree of the A. fumigatus isolates was constructed using the benA and CaM genes (Additional file 3: Figure S2). In 4 out of 87 isolates only one of these genes was amplified successfully (Additional file 1: Table S1). The tree based on CaM (Additional file 3: Figure S2) showed no subgroups of isolates. They all grouped with A. fumigatus Af293 and NRRL 163 (Additional file 3: Figure S2, left) but not with the emerging fungal pathogen A. felis  (Additional file 3: Figure S2). The same result was obtained when the tree was constructed with benA sequences (Additional file 3: Figure S2, right), indicating that these markers are unable to distinguish between the set of isolates used in this study. Fungal isolates from an individual dog were of the same mating type, while both mating types were present in individual human patients (4 out of 9). The 9 infected dogs had either isolates with MAT1.1 (4) or MAT1.2 (5). The fungal isolates from humans (15 isolates having MAT1.1 and 12 isolates having MAT1.2) and indoor and outdoor substrates (12 isolates having MAT1.1 and 13 isolates having MAT1.2) also showed a ratio close to 1. Because of the inability of the previous markers to differentiate between isolates, genetic heterogeneity was further analyzed by microsatellite analysis using the STRAf assay. A total of 59 A. fumigatus genotypes were found within the 87 isolates with a genetic distance between the isolates ranging between 0.056 and 0.496 (Fig. 1). Most of the isolates were found to be of a unique distant genotype. In the case of indoor and outdoor substrates only two genotypes were represented by more than one isolate. Similarly, most of the isolates from a human individual were of a different genotype (Fig. 2). Moreover, genotypes were different between human individuals except for genotype 10 (Additional file 1: Table S1) which was found in two human patients. In contrast, the 27 dog isolates from the 9 dogs grouped only in six clusters. The isolates derived from an individual dog all had the same genotype (Fig. 2, Additional file 1: Table S1). Most isolates showed a colony and conidiophore morphology typical for A. fumigatus(Fig. 3). However, the isolates from dogs were phenotypically more diverse as compared to those from the environment or humans (Tables 3 and 4). Variation was also observed between isolates from a single dog. This was the case for dogs CP1, CP2, CP4, CP7 and CP8.2. Conidiophore morphology was atypical in 12 out of 27 isolates from dogs. 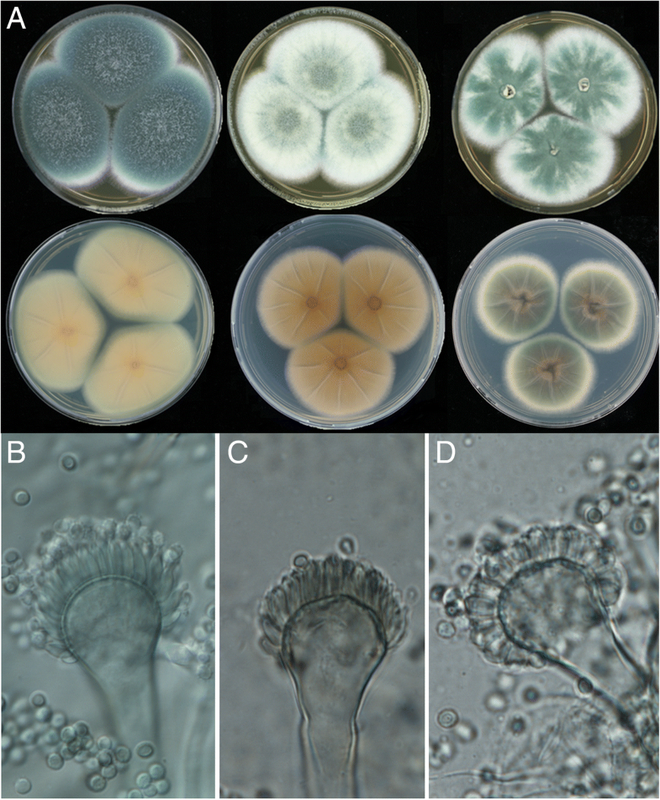 Furthermore, whitish colonies with concentric green rings of conidia forming conidiophores were observed in 12 out of the 27 fungal isolates (Fig. 3). This phenotype was associated with reduced production of conidia as compared to the fungal isolates from human patients and outdoor en indoor substrates. Acidification of CREA medium was not observed in the case of human isolates and the reference strains but was detected in 7 out of 27 fungal isolates from dogs and 12 out of 27 environmental isolates (Table 3 and Additional file 1: Table S1). Additionally, high variation was observed in the average diameter of colonies of isolates from dogs grown on CREA, MEA, YES, DG18, CYAS (Table 5). PCA and k-means clustering using colony diameter as a proxy for growth showed that one cluster contained only 5 isolates from dogs (DTO 303-E6, DTO 303-F5, DTO 303-E5, DTO 271-B3, DTO 271-B2) as well as A. fumigatus var. ellipticus (cluster 1 in Fig. 4) The isolates from indoor and outdoor substrates and human patients were distributed in clusters 2 and 3. Fourteen and eight isolates from dogs clustered in clusters 2 and 3, respectively (Fig. 4). Microdilution assays showed that 12 out of the 29 human isolates were resistant to itraconazole, posaconazole and/or voriconazole. Of these isolates, 6 showed a TR34 promotor duplication in cyp51A and 5 a TR46 duplication in this gene. One resistant (DTO 060-G9) and 3 intermediate resistant (DTO 028-D6, DTO 086-C1, DTO 089-G1) posaconazole strains were identified in the environmental isolates from the Netherlands. Dog isolates were all sensitive to the azoles tested, and both groups of strains (Dog and environmental) did not show TR34 and TR46 mutations. The Af293 strain was sensitive to itraconazole and posaconazole and resistant to voriconazole like the results presented by Mowat et al. 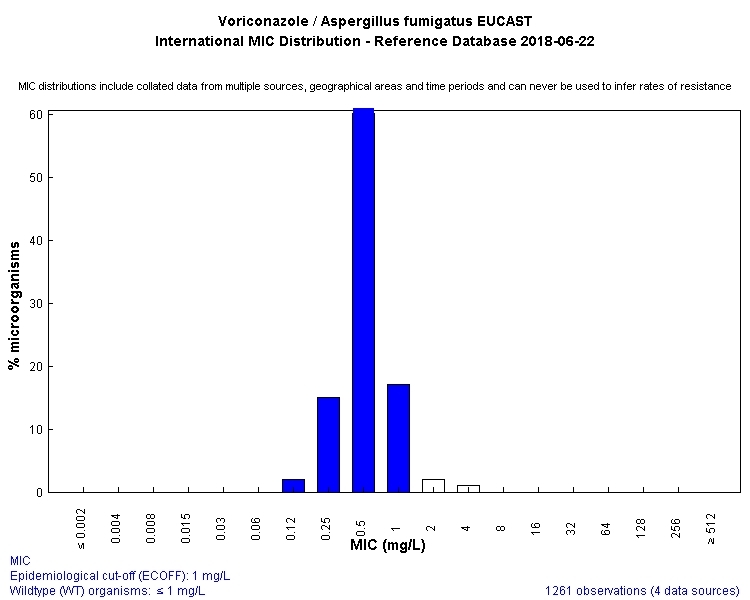 (Additional file 1: Table S1) and the EUCAST MIC distribution for Af293 (Additional file 4: Figure S3) Af293 is however generally considered susceptible for this azole. We assessed phenotypic and genetic differences between strains of A. fumigatus isolated from indoor and outdoor substrates and from infected humans and dogs. Genetic analyses did not indicate the existence of sub-groups within A. fumigatus specialized in infecting human or dog. A notable variation in phialide morphology, sporulation, colony size, and colony color was observed between strains isolated from dogs suffering from SNA; even between isolates from the same infected individual. This phenotypic variability was not associated with genetic differences in the benA, CaM, MAT1–1, MAT1–2, cyp51A loci and microsatellites. This indicates that the dogs were infected with a single strain. It is tempting to speculate that the phenotypic differences evolve within the dog during the infection process due to epigenetic changes or mutations. The fact that phenotypic variability was hardly observed in isolates from human and from indoor and outdoor substrates suggests that the dog sinus induces phenotypic evolution. SNA in dogs is a chronic infection starting with an inoculum in the front of the sinus . This may be the cause of the observed variation in the dog isolates. A long exposure to a stressful environment and for example host immune response, nutrient, and gas (oxygen) availability may act as a selection pressure . Reduced asexual reproduction, as observed in 11 out of 27 dog isolates can be an adaptation to increase fitness in the host [38, 39]. Similarly, higher growth rate at 37 °C have been correlated with increased virulence . Notably, in our study isolates from dog and humans had a higher growth rate on DG18 media as compared to the environmental isolates. The real meaning of this variation of growth for virulence is unclear and requires further investigation. The observation that a single genotype persist in a dog could suggest that the spread of the fungus in the sinus proceeds gradually associated with a non-sporulating biofilm but not invading the epithelium of the sinus . The infection within human patients is also different from dogs because human patients can carry multiple A. fumigatus strains [42–44]. This was confirmed in our study by the presence of MAT1–1 and MAT1–2 strains isolated from an individual patient that had different microsatellite profiles. It should be noted that it is difficult to associate the human isolates with a proven infection since they were obtained via bronchoalveolar lavage or sputum samples and not from deep tissue samples. Clinical azole resistance in the Netherlands is 5–20% for A. fumigatus isolated from human patients [25, 30, 45]. The majority (89%) contain TR34/L98H or TR46/Y121F/T289A mutations, while 11% of the resistant isolates carry wild type cyp51A . In our study, tandem repeats TR34 or TR46 were only detected in human clinical isolates. A single posaconazole resistant isolate from environmental isolates was found which was not TR associated and future genome sequencing should illuminate the resistance mechanism involved. Jensen and colleagues  found few azole resistant environmental isolates (4/133) in the National Mycology Reference Laboratory of Denmark. In contrast, Klaassen et al. reported that 16 out of the 213 clinical isolates and 9 of the 42 environmental isolates contained the TR34/L98H allele associated with multi-triazole-resistance. Clearly, extensive azole fungicide use in the environment can result in selection of azole resistant strains and complicate clinical management . A survey including whole genome sequencing (WGS) between environmental and clinical isolates can give clues about the evolution of resistance in both niches . Taken together our results showed that phenotypic and genetic heterogenicity is a key factor to understand several aspects of infections caused by A.fumigatus. 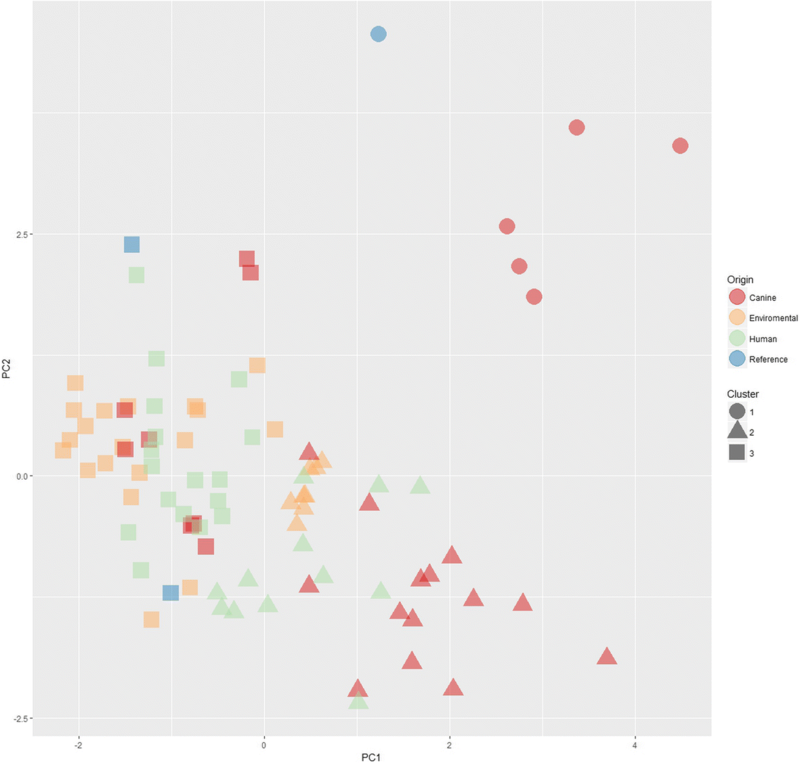 Dog SNA isolates were phenotypically more diverse than human and environmental isolates. Additionally, using the STRAf assay we observed that fungal plaques from dog suffering SNA harbour isolates genetically identical (one genotype), while humans with suspected IPA are infected with multiple genotypes. Phenotypic variation in dog isolates might be due to genomic differences or epigenetic variations and due to host adaption during the chronic infection process in dogs. New experiments aiming to understand the genomic, epigenetic and physiological adaptations of the isolates studied can provide clues host-driven evolution and its implication in virulence and control of the disease caused by this pathogen in humans. HABW and HC conceived and designed the experiments. IV, JB, AH, NE, FH, JFM, PJH and JH performed the experiments. IV, JB and HC analyzed the data and prepared figures. IV, JB and HC prepared reagents/materials/analysis tools. IV, AH, FH, PJH, HABW, HC and JH contributed to writing and revision of the manuscript. All authors read and approved the final manuscript. Isolates from dogs were obtained with owner’s consent applying a standardized protocol. Standard care was performed when obtaining the human isolates applying a standardized protocol.